There are loads of cereal and snack bars out there but they nearly all contain one allergen or another. Most of the healthier ones contain nuts or nut warnings. The gluten and nut free ones are rarely free from dairy and other allergens. And if they don’t contain any allergens they invariably contain a ‘may contain’ warning. So what do you buy to take in your bag when you’re on the go? Something practical which doesn’t melt. Won’t leak in your bag and is easy and quick to eat. Here are a few of my favourites with one clear winner by a massive majority – my latest delicious freefrom find – Frank bars. 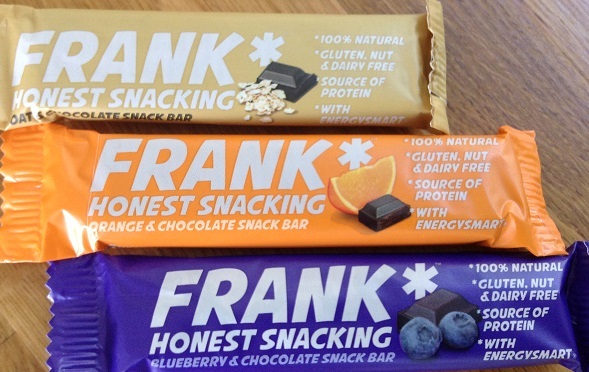 Frank Bars – Frank is a new company making totally freefrom snack bars. These came in by far the winners in the taste test. They are really too good to be just a snack and come in a number of flavours including blueberry and chocolate. FRANK bars are a deliciously indulgent snack bar made with 100% natural ingredients such as wholegrain oats, dates & dried plums and topped with a delicious dairy free Coconut Cream chocolate. You can buy these on the Frank website for about 85p for a 35g bar each if you buy a box of 20 assorted flavours. Bear fruit Yoyo’s and nibbles are just dried fruit – they contain no nasty sulphites at all and in fact, no additives or preservatives. Just fruit and a bit of pure fruit juice. They are tasty and great for a snack when you’re out as they come in small packages and fit easily into your hand bag. They don’t melt and give you a good boost of fruity energy with very low calories, only 87 per bag. You can buy these in most shops and also online and they usually cost under £1. Online you can buy a box of 18 YoYo’s for £8.82 making one yoyo cost just 49p for a 20g snack. Goody Good Stuff sweets – These are delicious and are all totally freefrom. Flavours include Strawberries and cream, tropical fruit and sour fruit salad to name just a few. You can buy these in many supermarkets and health food shops or online at Goodness Direct. A bag of these costs approximately £1.49 per 100g bag. Fruity School Bars – These are great because you can buy them almost anywhere from your local Co-op and Budgens to main stream supermarkets. They are often hidden in the home baking section – I don’t know why but they are worth hunting for. All of the rest listed above need some hunting around to buy or some online shopping. School Bars come in lots of fruit flavours including apple, strawberry and blackcurrant. They are gluten and dairy free and taste quite good. They do look a bit like a dog biscuit but they’re not bad for a snack on the go and are fairly cheap to buy. For a box of 5 x 20g bars they cost about £1.98 so they are about 40p each. Happy Kitchen Vegan, Gluten-Free, Sweetened with Fruit Chocolate Brownie 55g – contain Fruit extracts (apple, carob, grape), cacao mass 23.3%, brown rice flour, coconut oil, cocoa powder 0.9%, vanilla powder, sea salt and a touch of baking powder. These are quite nice but do have a bit of a funny after taste and on further research they do make a nut version so perhaps not suitable for people with a nut allergy. The come in little individually wrapped packets and were the most expensive at £1.49 each for a 55g cake. So what’s your favourite freefrom snack bar or treat? Are there any others that are freefrom soya, dairy, gluten, wheat and nuts out there? I can recommend 9 Bar Snack Barsto be added to this list, they are gluten, wheat and chocolate free! Some of the bars are even vegan friendly so it allows a lot of people to enjoy them!